Able to see spirits and ghosts from a young age, Ichigo Kurosaki must hone these special gifts in order to become a Soul Reaper, saving his family and the town of Karakura from the deadly 'Hollows'. 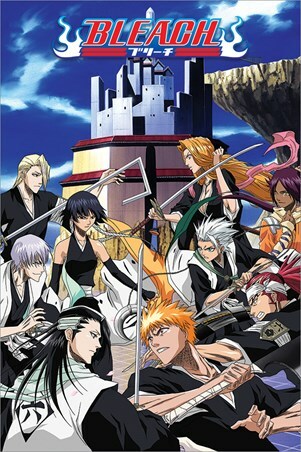 Battling fiercely in this fantastic montage from Bleach, Ichigo is joined by his flame haired wife, Orihime Inoue and his fellow Shinigami 's as they face new enemies and rival reapers. If you're just as enthralled by this spectacular anime saga as we are then what better Bleach poster to have hanging on your walls whilst eagerly awaiting a new adventure!